13.5% alc. Pale gold colour. Nose of spice, licorice allsorts, and ripe luscious golden stonefruit and melon. Cheery and fine. Sweet and dense in the mouth, rich fruit. Long luscious honeyed finish. Flavours of pear and navel orange. Peppery and gritty in character and texture. Deep dark carmine. 13.5% alc. A big, rich and expressive aroma. Plums, savoury with vanilla and white pepper, balsa wood and spice, and a hint of funk. The flavours show sweet on entry, with rich dark fruit through themed-palate and supple tannins with just enough grip to balance the floral nose, and heat and length at the finish. This is such a good wine I can really see the kinship this grape has with Pinot Noir. A heady nose paired with a feminine quality on the palate. Sophisticated, delicate fruit with a good core of weight. From grapes off Gimblett Gravels and Bridge Pa Triangle vineyards, taasted and bought at the Te Awanga winery. Inky scarlet colour. 13.5% alc. While 2013 was good for ripening Cabernet Sauvignon, 2014 was a good year for Merlot. This wine showed an expressive bold hit of perfume, soft fruit, plums and vanilla. A gorgeous nose; savoury and smoky. Rich ripe fruit on the front of the palate, plenty of fruit weight through the middle, supple tannins and a pleasant brusqueness at the finish. Mouthcoating and long. Produttori del Babaresco Nebbiolo Montestefano 2007 – $$$+ – drink 2017-2022. Plucked from the MS wine ballot after the Produttori del Barbaresco horizontal tasting. Delicious. One of the world’s great wine styles. 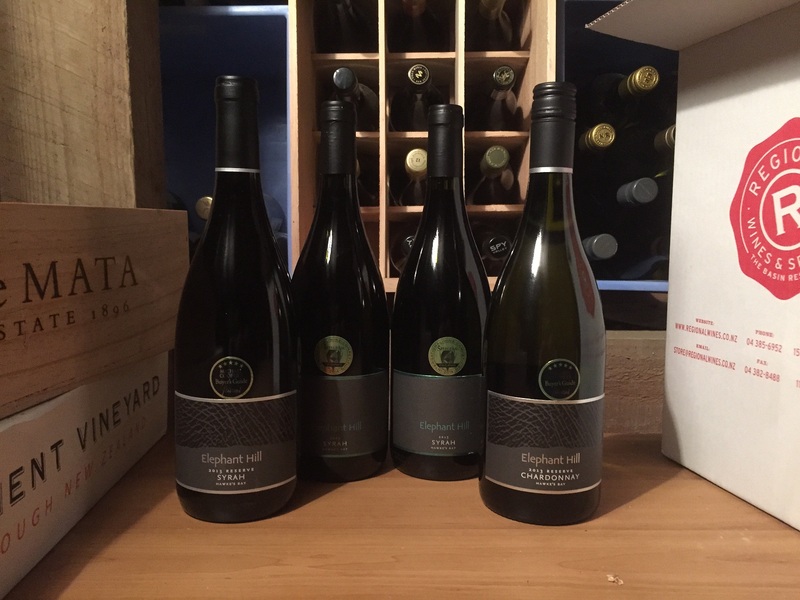 Elephant Hill Airavata Syrah Te Awanga HB 2013 – $$$$ – drink 2018-2028. Not tasted, but if judged by both the 2013 Syrah and Reserve Syrahs out of Elephant Hill this will be a Stunnah. Esk Valley Heipipi The Terraces Merlot Malbec Franc Bay View HB 2013 – $$$$ – drink 2018-2028. Tasted at the Winery. Fantastic. A longsleeper, this. Coming back from our Lake Waikaraemoana tramping trip, and passing through Hawkes Bay, I was super-fortunate to have the time and space to visit a number of my very favourite NZ wine producers with my lovely L.
Esk Valley was first up. Esk Valley is situated beside the coast at Bay View north of Napier. Behind the winery were the famous Terraces, facing north and the sea, first terraced and planted by owner Robert Bird with hybrid wines in the 1940s. Low yields and high production costs saw those pulled out and the hillside planted in pines. Pine tree cones make poor wine so when George Fistonich of Villa Maria bought the property in 1989, the pines were in turn pulled out, and plantings of cabernets, merlot and malbec vines were dug in. Cabernet Savignon proved hard to ripen consistently at this cool coastal location, so those vines were pulled out in the mid-90’s and replaced with more Merlot and Malbec vines. L and I tasted through a range of their standard wines – Savvy, Chardy, Rose, Pinot Gris, Syrah – then we paid a $10 fee to try the Terraces 2014 blend in a separate room. This was presaged by tastings of the standard 2015 Merlot Cabernet Sauvignon Malbec blend (a go-to red of mine), then the $60 Winemakers Reserve of the same blend (delicious, complex, aromatic). The Terraces was powerful and refined, with a wonderful aroma. Enough for me to invest in a bottle. A lot of money has been spent establishing Elephant Hill, starting with situating a very impressive bronze elephant before a huge copper-clad winery. The tasting room is one of NZ’s finest, with a high-cuisine kitchen attached, and a sunny terrace out from. We tasted through their wines, before settling down to a nice Chardonnay and Gris with a cheese platter. And I bought a bottle of their top rated syrah, the Airavata from 2013. The next day we went out for a bike ride, intending to head from Clive up to the top of Te Mata Peak. We were running a bit short of time, and were waylaid by the tasting room at Te Mata Estate instead. I didn’t need much persuading: anyone who reads my blog knows I really rate these guys work. We tried the latest Cape Crest Sauvignon Blanc, Elston Chardonnay, Gamay Noir, Bullnose Syrah, and Awatea red blend. We couldn’t carry anything on our bikes, so we left with our bank accounts intact. Our time riding was short due to a lunch date at the famous Clearview Estate vineyard café. It was packed. We settled in, ordered our starters and our mains, before heading to the tasting room. We tried their large range of wines, and listened to a very funny and engaged hostess shared information and gags in equal measure. I was even treated to a taste of their $150 Basket Press red blend. For lunch I had to have a glass of their Semillon (quite rare to see a NZ version for sale by the glass), and then their Malbec to go with my steak. Both were yum. M shouted me to this tasting at Regional Wines and Spirits hosted by Richard Sherriff. I tried this producer’s Syrah after a Taupo Cycle Challenge a couple of years back and I was really impressed at what they were doing. So I was well pleased to be invited along! Elephant Hill is owned by the Weiss family. It is a boutique producer of sustainably-produced hand-crafted wines, located on the Te Awanga coast of Hawkes Bay. It produces about 20,000 cases PA at present. I am told it also boasts a fine restaurant, which features dishes well-paired to the wines. The site is named for a life-size teak sculpture of an elephant the owners brought back from a trip to the sub-continent. As you do. 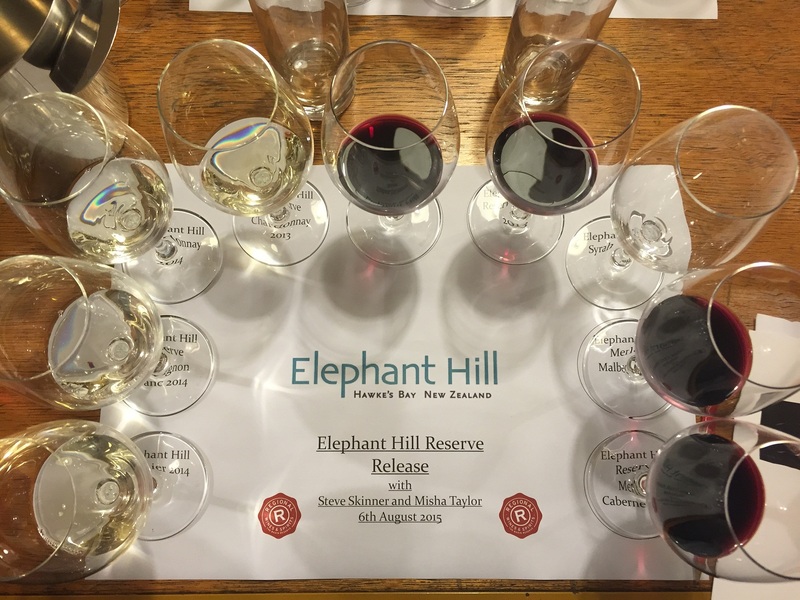 Elephant Hill has three vineyards – Te Awanga with coastal shingle and clay, Gimblett Gravels with inland stony gravels, and Bridge Pa Triangle with inland alluvial and red metal soils. The wines were poured in advance, non-blind. They were presented by winemaker Steve Skinner and Marketing Manager Vince Labat.